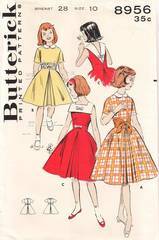 Original vintage sewing pattern for girls dress with a variety of features to create your own look in casual or dressy style. Inverted front and back double pleats in the skirt. Wide midriff interest or kerchief-tied midriff belt. Square neckline with V-back and oversized collar or high round neckline with Peter Pan collar.